From law offices in Christiansburg, Virginia, Wolfrey Law, PLLC offers the personalized legal counsel and representation that many residents of the New River Valley and the Roanoke metro statistical area (MSA) need and expect. For every case and every client, the goal of a favorable outcome is kept clearly in focus at all times. Every case is unique, with specific challenges and opportunities for successful results such as reduction or dismissal of charges. Defense of traffic violations such as reckless driving constitutes a large portion of the law firm's caseload. 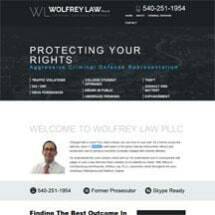 Wolfrey Law, PLLC is a law firm committed to informing clients of their rights. Defense lawyer Jason V. Wolfrey determinedly defends those rights before prosecutors and judges. Legal practice areas of Wolfrey Law, PLLC include criminal defense and traffic violations. Drunk driving charges, student crimes (such as underage drinking, sexual assault and theft) and reckless driving charges are among the legal issues successfully handled by Wolfrey Law. Attorney Jason V. Wolfrey is a former prosecutor with a great deal of experience handling traffic violations and general criminal defense in the courtroom. He knows how to discover and exploit holes in prosecutors' cases against clients of Wolfrey Law, PLLC He devises and implements promising defense strategies on behalf of truck drivers, private motorists, Virginia Polytechnic Institute and State University (Virginia Tech) students, and members of the public at large.